through LHM Charities and Make-A-Wish. Photo by Scott Filipiak. 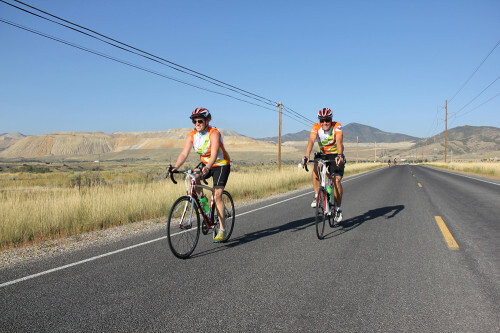 July 27, 2015 – Fast becoming one of the mainstays on the Utah ride calendar, the 5th Million Miles at Miller Charity Ride presented by Mountain America Credit Union will be held on September 19 at The District in South Jordan, Utah. With several ride options, and a great charity component, there is something for every cyclist. 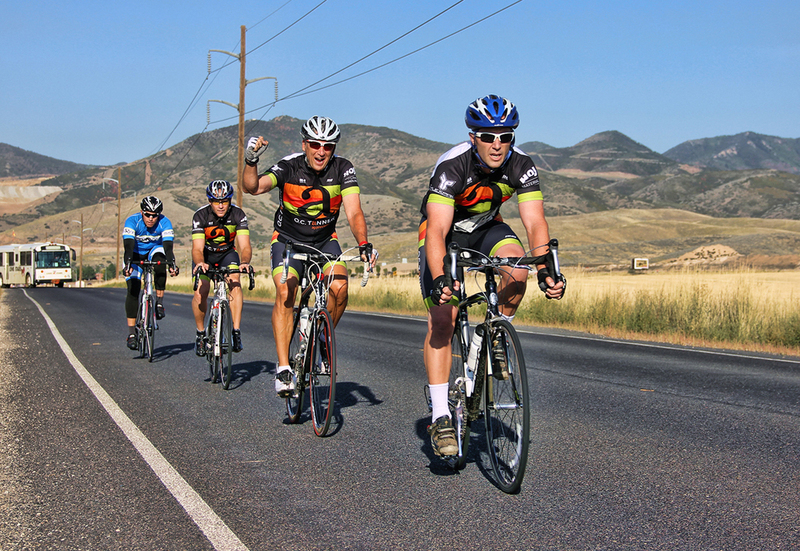 We asked Jack Sanford of the Larry H. Miller Group of Companies to tell us about the ride. Cycling Utah: Tell us about the courses and ride options available for cyclists. What are some of the highlights of the course? Million Miles at Miller: We’re in our second year at the District in South Jordan and we wanted to create routes that are safe yet challenging enough to make them fun. This year we have a 10-mile route with right turns only for beginning riders. Our 25-mile route has a steady, slow climb up to Copperton before it heads south through the Rose Canyon area of Herriman. The 50-mile and 100-mile routes stay with the 25-mile riders until they exit Rose Canyon Road to head south toward Lehi. The 50-milers will complete a “double feature” – visiting two Megaplex Theatres as part of the ride. Our century riders will head out to Cedar Fort and then complete the “triple feature” by visiting the brand new Megaplex Theatres at the Vineyard in Geneva. CU: The Million Miles at Miller ride is a fundraiser. Please tell us about who the ride raises money for this year (include various beneficiaries of LHM Charities)? What is the focus of the various charities? How much did the 2014 event raise? MMM: The Larry H. Miller Group of Companies have a legacy of giving back to the communities where we do business. Million Miles at Miller is one of many events held each year which raises funds for various local organizations and groups with a focus on issues that affect women and children, especially in the areas of health and education. LHM Charities helped support over 100 organizations in 2014, ranging from Boys & Girls clubs and womens shelters to literacy programs and wellness initiatives. Million Miles at Miller enables us to merge our fulltime LHM Group employment with our passion for cycling. For the past two years, Make-A-Wish Utah has been our charity partner in the cycling event. They are a great organization and lend a special flair to our festivities. Through the efforts of our riders and sponsors, we were able to present a check for $48,000 to Make-A-Wish Utah to help grant children’s wishes. County and Utah County. Photo by Scott Filipiak. CU: Million Miles at Miller has the support of the Larry H. Miller organization. What is the involvement of the LHM Group in the ride? Tell us about how this aligns with your values. MMM: Our entire staff is employed by the Larry H. Miller Group, which enables all of the funds our riders raise to go directly to charity. Gail Miller, our owner, has said, “By giving, working and serving in our communities, we enrich our lives and the lives of others.” Million Miles at Miller is a direct reflection of that belief. Our tagline sums it up best: One Bike. Two Wheels. A Million Ways to Share. In addition to our staff, our fixed operations group, Saxton Horne Communications and several of the Larry H. Miller dealerships put together teams of riders and are always among our top fundraisers. CU: Tell us about the rest stops. What can riders look forward to during the event? MMM: The start/finish at the Megaplex Theatres at The District has a real party atmosphere. There’s a kids zone, vendor fair area, music, free movies, food, and fun for the whole family. We love to spoil our riders on the roads too. Nicholas & Company is our food partner again this year, and they go over the top in providing food and fuel for the cyclists. Our stops are spaced about 10 miles apart and include energy drinks, nutrition bars, fresh fruit, as well as a wide assortment of pocket-sized snacks. In addition to the rest stops, Infinite Cycles is providing SAG vehicles for the routes to help out with any issues riders might encounter on the roads. Our ride concludes with a fantastic BBQ lunch – so no rider should go home hungry. CU: How many riders do you expect this year? There’s a corporate team option – can you tell us about that? MMM: We are anticipating 400-500 riders this year. Our event has grown by 20% year over year, and we are on track to do that again this year. Cyclists have the option to ride as an individual, join a team or create their own team. There is a separate fundraising prize for the top teams. Several of our sponsors are putting teams together as well. CU: Is there anything else that you’d like to add? MMM: This event would not be possible without the support of our sponsors. We are fortunate to have so many generous businesses in our community. We have partnered with Zaavy Custom Apparel to give every fundraising rider a sport-fit event jersey—something we’ve never done before—which is part of the appeal to this year’s ride. In addition to the free jersey, finisher’s medal, Utah Jazz and Salt Lake Bees tickets, and giveaways, one lucky participant will win a new SCOTT Solace carbon road bike.